I am starting this newsletter from Uluveu Island and it has been two years since we have been on the island. Accompanying me is David Ambong a local Ni- Vanuatu printmaker from Port Vila, Michelle Page an artist and teacher from New Zealand, Peter Whitehouse a builder and cabinetmakers from New Zealand, Sally Peet Registered Nurse from Australia and Robyn Watson, Dental Hygienist also from New Zealand. Joining us for clinics from Lamap Hospital is Diana Watson Midwife from New Zealand. We have all come to Uluveu to spend the next two week working with the community. I am adding this footnote at the top of the page as it is the most important information I have to offer. Once you read the health section you will understand. For many years now we have worked with the local community, helping in many ways but always under their guidance and suggestions. This year we needed to get a two year old from a remote village with no road and a dangerous coastline, to hospital in Australia. A mission no one else was able to achieve. For this mission we needed the help of all our extended family in Vanuatu. We meet these people when they were teenagers, now they are adults and ready and willing to assist us, and without their help we would not have been able to get young Jack to hospital. Sally and I would like to thank, Captain Thompson Massing, Rolini Phillips and Vincent Makai, without whose help this mission would not have been successful. 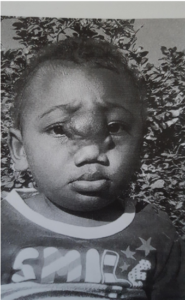 Meet Jack Kalangis, a two year old baby with a facial tumour. Jack lives in the village of Farun, on the south coast of Malakula. 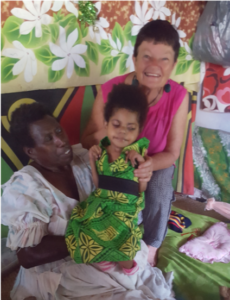 The first part of our time in Vanuatu was spent getting birth certificates, passports and visas for Jack and his mother Bova, to travel with Sally back to Australia for an operation. Sally was contacted by Children First Foundation in Melbourne Australia and asked to bring Jack and his mother Bova to Australia. The tumour is centred between his eyes and is growing over his eyes and working its way into his nasal passages. Eventually he will be blind but worse than that, eventually he will not be able to breath. This operation, if successful will save Jack’s life. Jack and his mother Bova did not have birth certificates so we had to start from the beginning. First, birth certificates then passports and visas. Once we arrived at Uluveu Sally travelled with Vincent Makai to Farun by small boat to meet with Jack and Bova, arrange their journey and take passport photos. Farun Village in on the South Coast of Malakula, very remote with no road access. The only way there is by small boat and it has a particularly dangerous coastline. We have no idea what the outcome will be for Jack as the surgeons have not yet examined him. We do not know if the tumour is malignant or if it can be removed. Kylie Cyrus will also be accompanying Sally back to Children First Foundation (CFF), to have her prosthetic leg realigned. This will be Kylie’s fourth trip back to CFF. 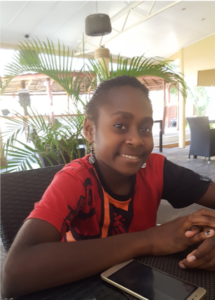 Kylie is now 15 years old, she is top of her class and hopes to train as a school teacher. Daisy from Pellongk village has cerebral palsy, she is nursed by her grandmother. We are able to assist her grandmother with therapeutic aid to help make her job a little easier. With no regular medical assistance such as physiotherapy, Sally has to teach Daisy’s grandmother these mobility and massage skills. 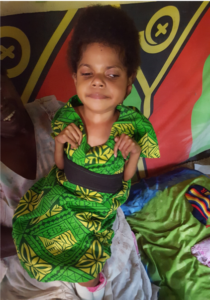 This visit we were able to bring her a new seat so she can now sit up unaided. Daisy is unable to chew food so she has to be fed mashed vegetables, milky drinks with milo from a teaspoon. We were also lucky enough to have the expertise of Robyn Watson, dental hygienist from New Zealand. Robyn was able to visit the schools at both Avokh Island and Uluveu Island. Her report was that the children’s teeth in the two schools she visited were good and prevention methods have been successful. There was good evidence of regular brushing and she further educated the children on how to protect their gums by cleaning the food from in between their teeth. Gum disease is common in the remote islands especially in adults, these prevention methods will be valuable. All the years of dental training and supplying tooth brushes have definitely seen results. As usual Sally Peet has seen many patients on Uluveu. She expressed her concerns for the elderly at the Chiefs meeting. Sally found that many old people are dying in very uncomfortable environments and she requested more care for the elderly by the community. There is no nurse on the island at present and this is hard for the community and a great worry for Sally. We realise that the nurse’s accommodation and the clinic need to be upgraded. building supplies to complete the nurses house, then the Uluveu Builder’s Workshop will complete the project. If we are turned down by the Ministry of Health we will have to fund raise for this project as the community need at least a nurse in attendance. Diana Watson from Nomadic Midwives came over from Lamap hospital, where she delivers many babies. For two days she travelled through the villages with Sally visiting all the pregnant women. Much has happened at the pavilion since our last visit. A much needed salt water tank has now been installed at the pavilion. This will ensure that there are no more airlocks in the pipe that feeds salt water to the reverse osmosis watermaker. 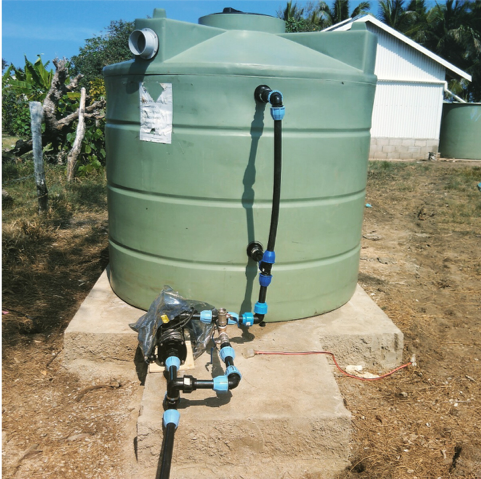 This was installed by Kalo Enrel, local builder/plumber and Dave Lawson New Zealand engineer living in Port Vila. Since the new tank was installed it has been much easier to start the water maker and the airlocks have stopped. While we were present the new pump for the showers was installed by Kalo Daniel and the water machine was working perfectly making safe clean water from salt water using only the power of the sun, no fossil fuels! Arriving in Port Vila on the 11 of June will be a new Tamutom block ice maker. The Tamutom will make 12 x 5kg blocks of ice in approximately 4-5 hours. These machines are designed to make ice in temperatures of 60 degrees, using solar power. Uluveu temperatures reach 30-32 degrees so we are waiting to see just how this machine will perform. The Tamutom block ice maker uses the least amount of power and therefore will protect the batteries. The ice will be sold to the local community, especially the fishermen who want to extend the life of their catch so they can get it to Port Vila fresh for sale. The freight and cargo boats will also buy the ice from the pavilion and the most important feature is that power used to make the ice is solar, therefore, no fossil fuels and nil power cost. NZCHET/Palm Project are always concerned about the cost to the environment and sustainability of any enterprise. The pavilion has already run an old block ice maker donated by the Ministry of Fisheries and this worked well but it was old and used too much power. The new Tamutom will replace it. A very successful chiefs meeting was held on the 10th of June at Uluveu also in attendance was The Palm Project governing body including Elder John Akurkur, who has recently join the Palm Project governing body, Sally Peet and myself. Documents were signed for the handover of the new block ice maker to the community and systems put in place for the running of the ice business. Jenny Balias manager of the soap factory will head the business and the chiefs will employ others to assist her. Monies raised from the block ice maker will be used for the upkeep of the pavilion, making the pavilion sustainable and independent. Any extra money will be used by the community and decided on by the community. The Palm Project Soap Factory continues to make its wonderful products with sales in both New Zealand and Vanuatu. and the school children continue to shower at the pavilion with the soap. The school children are healthy and skin and eye infections markedly low. 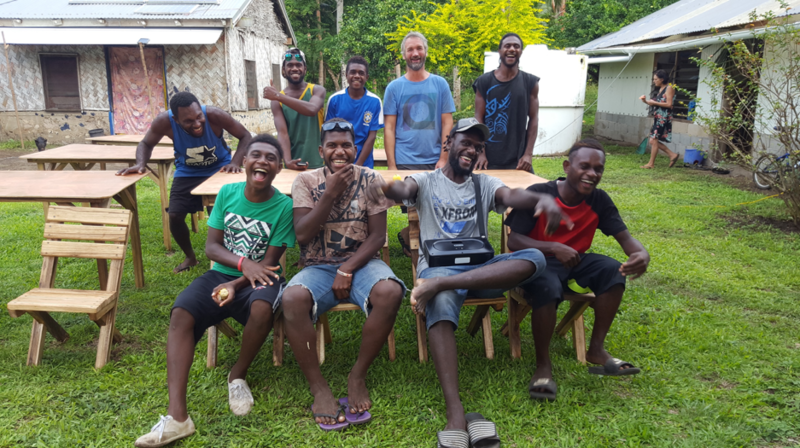 The Uluveu Builders Workshop requested a return visit from Peter Whitehouse in the form of a furniture making workshop. The workshop producer’s furniture for the local market and the mission this time was to change from nailing the furniture together to countersunk screws with glue. Joins, angles and mitres were also updated for chairs, tables and beds. New ways of putting house posts into the ground to stop the timber from rotting were looked at. The young builders have been so enthusiastic, they enjoy Peter’s teaching skills and his delivery. We feel that Peter has developed a strong working relationship with these young men and they have already invited him back. The two water projects at Melip and Mbonovor, completed in 2016 by the Uluveu Builder’s Workshop have given a new confidence to the builders and already they have many more projects. NZCHET/Palm Project are grateful to have such an empathetic skilled craftsman like Peter who is willing to give his time to teach others. Peter with his students, all tables and chair were sold and everyone was happy! We are very privileged this season to have Michelle Page and David Ambong join us at Uluveu for a block carving art workshop. We requested the carvers/artists of the island to come and join this art workshop. David is an established Vanuatu Artist and his designs and techniques are new and exciting. The artists on the island have all the art supplies and Jenny the manager of the soap factory has approved the use of the factory on a regular basis so they can continue their endeavours and improve their skills. 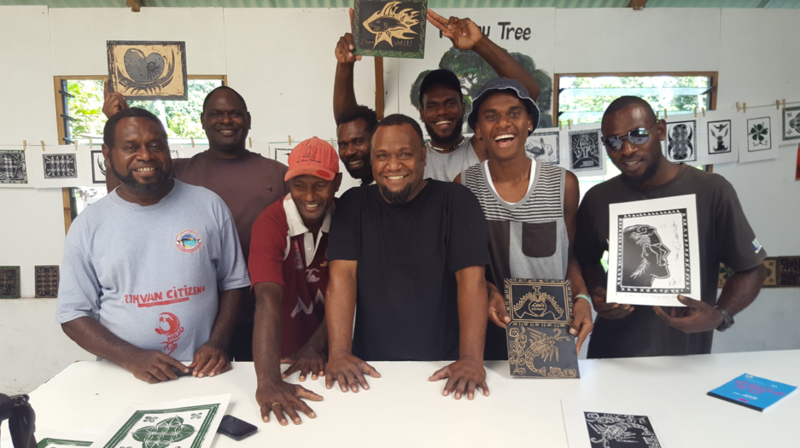 The art works created at this workshop will be on sale at the National Museum of Vanuatu in Port Vila. had to use all our resources and strength to achieve this mission. If I were the Australian Government I would have sent a private plane for wee Jack! This year Chief Kren died from diabetes related complications. He refused treatment at the hospital in Vila, we are sure he had his reasons. Chief Kren will be greatly missed by us all, he was a great man and a wise and fair chief.